I wanted to make something right away with this gorgeous rainbow-colored BFL wool sample. I loved this bright colorway with bright pink, purple, turquoise and gold. Again, with the sheep! Can you tell I love the sheep?! 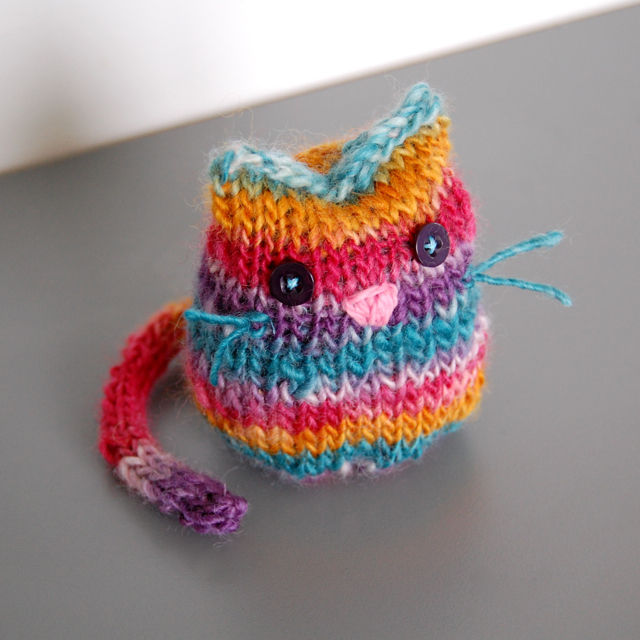 I used the wool sample to knit a tiny cat, using this pattern. I love how this yarn stripes and it was so soft and pretty to work with. Gorgeous stuff. Tiny button eyes and an embroidered nose and this little guy was done. Lo snatched him up right away. Next, I wanted to make something with one of these big guys. 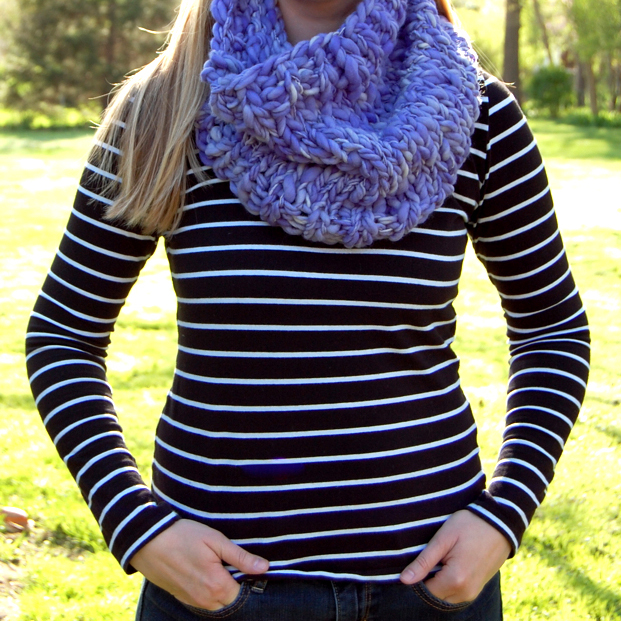 I chose the purple first and after feeling how incredibly soft it was, I decided to make a cowl. 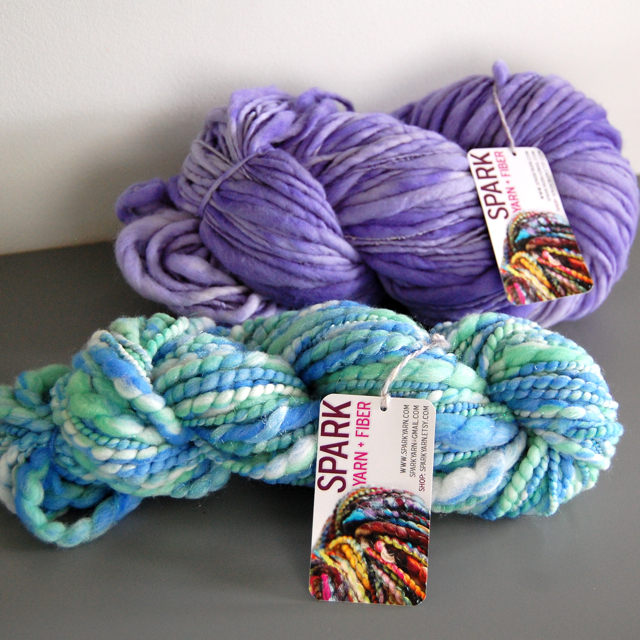 I must say – if you have any hesitation about the softness of handspun yarn, go with Spark. I'm pretty sensitive to scratchy yarns and this stuff is a dream. Zero percent scratchy. Also, you get tons of yardage in these big skeins. Definitely enough for a scarf or hat or cowl project. Here is my finished cowl. I just love the thick/thin texture and this will definitely be super warm. This soft purple color is super rad, too. 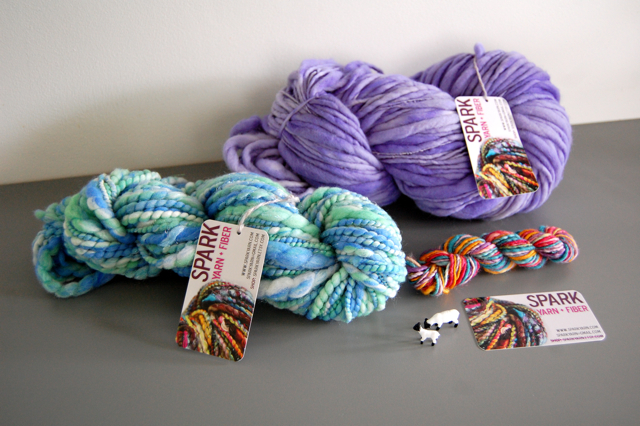 I am hoping to make a hat out of the second blue/green skein pictured above, but will tackle that another day! 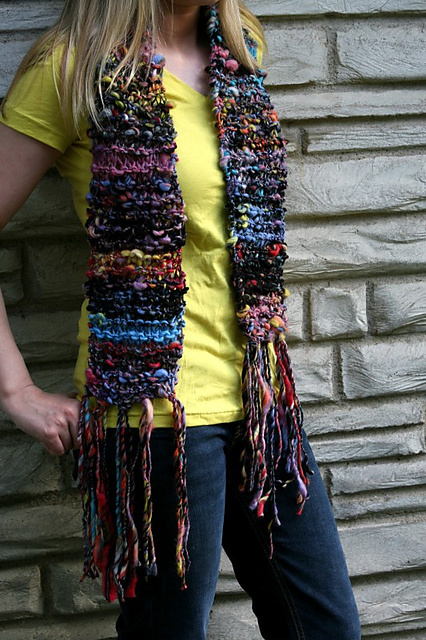 If you want to see more projects I've made in the past using Mary's handspun yarn, check out my Ziggy Stardust and Iron Maiden scarves from a few years ago. They turned out super cool and I will love them forever. 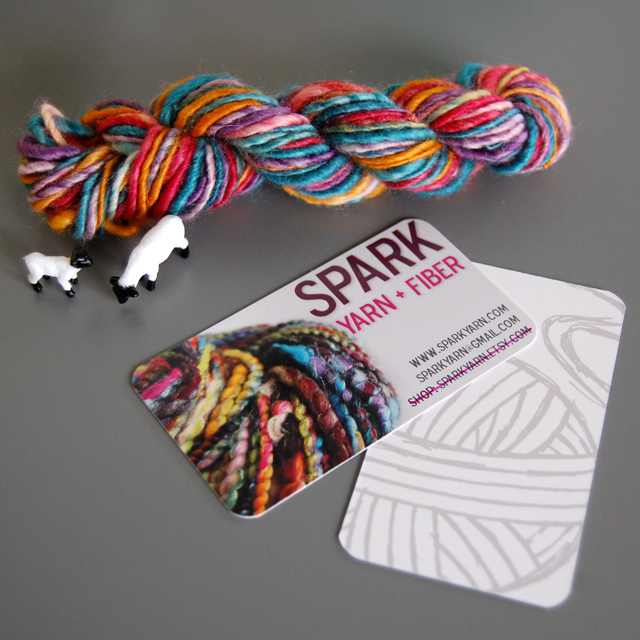 If you're looking for some fun handspun for yourself, definitely jump on over to Spark Yarn. Mary is currently living, working and spinning right here in Iowa, but has plans to move out West and run Spark from a cozy studio in the woods! She will be selling her awesome yarn and fiber products at Market Day in Des Moines this weekend, so definitely stop by and say hi.